Chemists at Carnegie Mellon University have demonstrated that synthetic nanoparticles can achieve the same level of structural complexity, hierarchy and accuracy as their natural counterparts - biomolecules. The study, published in Science, also reveals the atomic-level mechanisms behind nanoparticle self-assembly. The findings from the lab of Chemistry Professor Rongchao Jin provide researchers with an important window into how nanoparticles form, and will help guide the construction of nanoparticles, including those that can be used in the fabrication of computer chips, creation of new materials, and development of new drugs and drug delivery devices. 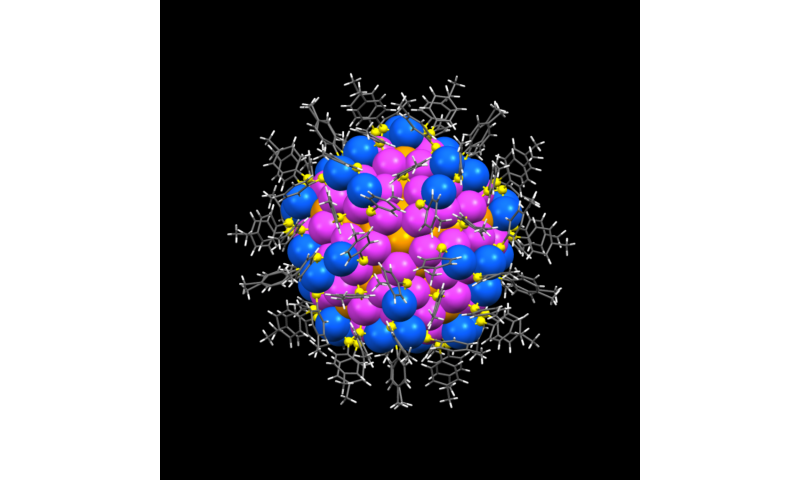 "Most people think that nanoparticles are simple things, because they are so small. But when we look at nanoparticles at the atomic level, we found that they are full of wonders," said Jin. Nanoparticles are typically between 1 and 100 nanometers in size. Particles on the larger end of the nanoscale are harder to create precisely. Jin has been at the forefront of creating precise gold nanoparticles for a decade, first establishing the structure of an ultra-small Au25 nanocluster and then working on larger and larger ones. 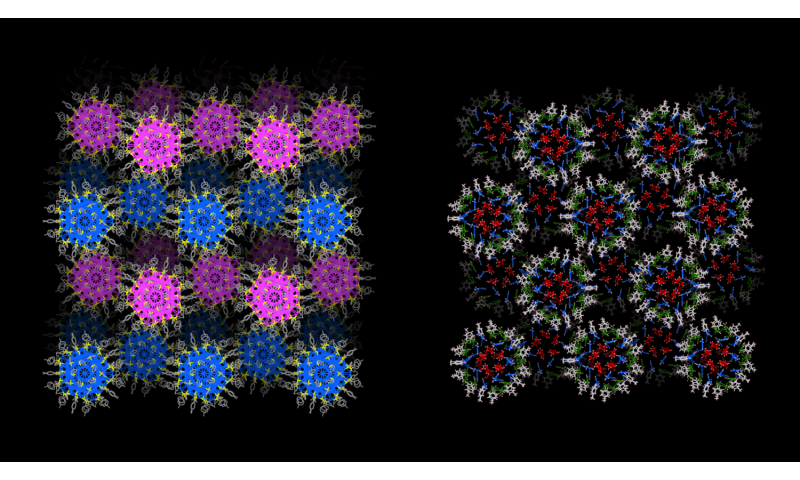 In 2015, his lab used X-ray crystallography to establish the structure of an Au133 nanoparticle and found that it contained complex, self-organized patterns that mirrored patterns found in nature. In the current study, they sought to find out the mechanisms that caused these patterns to form. The researchers, led by graduate student Chenjie Zeng, established the structure of Au246, one of the largest and most complex nanoparticles created by scientists to-date and the largest gold nanoparticle to have its structure determined by X-ray crystallography. Au246 turned out to be an ideal candidate for deciphering the complex rules of self- assembly because it contains an ideal number of atoms and surface ligands and is about the same size and weight as a protein molecule. Analysis of Au246's structure revealed that the particles had much more in common with biomolecules than size. They found that the ligands in the nanoparticles self-assembled into rotational and parallel patterns that are strikingly similar to the patterns found in proteins' secondary structure. This could indicate that nanoparticles of this size could easily interact with biological systems, providing new avenues for drug discovery. The researchers also found that Au246 particles form by following two rules. First, they maximize the interactions between atoms, a mechanism that had been theorized but not yet seen. Second the nanoparticles match symmetric surface patterns, a mechanism that had not been considered previously. The matching, which is similar to puzzle pieces coming together, shows that the components of the particle can recognize each other by their patterns and spontaneously assemble into the highly ordered structure of a nanoparticle. In future studies, Jin hopes to push the crystallization limits of nanoparticles even farther to larger and larger particles. He also plans to explore the particles' electronic and catalytic power.